I’ve finally found the perfect nutrient rich alternative for chocolate cake. My husband’s German grandmother is an exceptional cook who makes THE MOST AMAZING chocolate sheet cake I’ve ever eaten. When I found out I had a gluten sensitivity I reluctantly said goodbye to grandma Hanna’s chocolate goodness forever. After years of searching for a comparable alternative I’ve finally found one (truth be told, nothing can replace the original recipe, but this is a good runner up). Place the ground flaxseed, water, maple syrup, and applesauce in a mixer and mix on medium speed until combined. Shred zucchini and give it a light squeeze over the sink to remove excess moisture and fold it into the batter. Divide the batter evenly among 12 muffin cups, filling each 2/3 of the way full. Sprinkle the chocolate chips on top. Bake for 22-25 minutes and then allow to cool in the pan for several minutes. Transfer zucchini bites to a wire rack until completely cool. 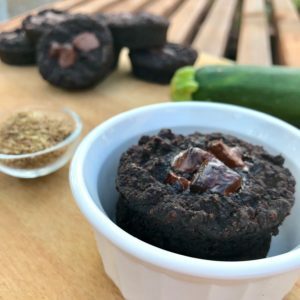 Chocolate zucchini bites pair nicely with nuts, nice cream, coffee, fresh fruit (like bananas, strawberries, and blueberries), or even a shot of whiskey 🙂 . I often use 1/4 cup chocolate truffles as opposed to chips because I find truffles to be a bit creamier in texture. If you’ve ever had a warm chocolate melting cake, you can achieve a similar result by adding 12 tablespoons of water rather than the 8 tables referenced in the ingredients list. Once the zucchini bites are finished cooking, you can eat them hot out of the oven, or warm them in the toaster oven at a later time. The gooey center will not disappoint.